Being part of PEB means that you will meet and interact with graduate students, postdocs and faculty affiliated with many different departments, and spread across the Science Hill area, the Yale School of Medicine, West Campus, and the School of Engineering and Applied Science. Several PEB courses are taught by pairs of faculty with complimentary expertise, many of whom also collaborate. Check out our Methods and Logic in Interdisciplinary Research and the Integrated Workshop courses described on the curriculum page. Several PEB courses, such as “Methods and Logic in Interdisciplinary Research” and the “Integrated Workshop,” incorporate peer teaching. These courses not only helps you learn new material but also teach you how to communicate effectively across disciplines. SDG is monthly interdisciplinary discussion group for PEB and the greater community, focusing on research-in-progress talks. Two PEB students with complimentary backgrounds organize the talks. Click here for more info. The Institute sponsors a Visiting Faculty Seminar Series on convergent research. PEB students typically invite and host one speaker each year. The Institute also sponsors Symposia and Retreats. 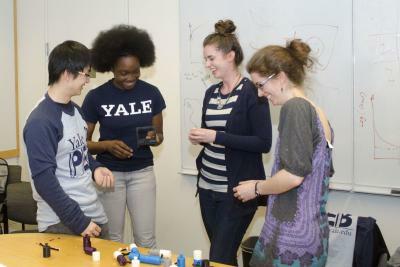 PEB students can participate in a variety of activities including devising and implementing science modules for Breakthough New Haven, a program that prepares middle school students from disadvantaged backgrounds for high school; working with 4-7th grade summer campers; and participating in various outreach activities planned by the Yale Science Diplomats. PEB students can participate in a variety of activities, including a PEB Career Series and a “Short Course on Communicating Science to the Public” led by the former chief science and health correspondent of NBC News, Bob Bazell. This NSF funded network serves to connect students and faculty at various institutions (domestic and international), all involved in interdisciplinary programs and research. All first-year PEB students attend the annual meeting of the PoLS SRN, held at one of the institutions in the network, and present posters on the modules they completed as part of the Integrated Workshop PEB course. More senior students give oral or poster presentations on their research. The PoLS SRN also funds short research exchanges within the network.